If you are interested in learning more about Growing Room Child Development Centers and all we have to offer, please stop by and visit either our Growing Room of Auburn or Growing Room of Opelika locations. Appointments are not necessary; however, we do encourage morning tours as it is the best time to see children engaged in our unique curriculum. We will show you the safe, secure environment, interactive experiences, and nurturing care your child will receive at Growing Room. A center director will be happy to answer any questions you may have about becoming a member of our Growing Room family! 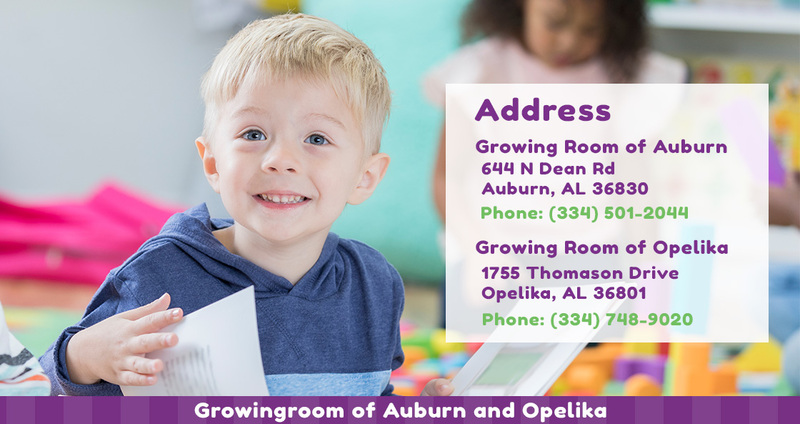 We look forward to meeting you and showing you why Growing Room of Auburn and Growing Room of Opelika are your preschools for Love and Learning: The Growing Room Way!